Vladimir Yakovlevich Klimov was born in 1892 in Moscow in the family of a construction worker. Following the advice of parents and taking into account the material possibilities of the family, he enrolled in a special technical school with a seven-year curriculum that trained the master mechanics. After graduating from college he continued his studies at the Moscow Higher Technical School. Professor N. R. Brilling, one of the largest heat engineers in the country, was then in charge of the mechanical laboratory of the school, where during this period Vladimir Klimov was engaged in the study of the thermal processes of internal combustion engines. This, apparently, largely determined his future specialty. He passed his undergraduate practice at one of the mechanical factories of Petrograd, and in 1916 he presented a graduation project of an aircraft engine, in which a special topic was the study of the processes of mixing in the carburetor. The council of the college, on the basis of the results of the defense of the graduation project, petitioned the leadership for the establishment of V. Y. Klimov of a special scholarship in order to provide him with an opportunity to prepare a Ph.D. However, the implementation of the intention failed. Since 1918, Vladimir Yakovlevich worked as head of the department of aviation engines VSNH. During this period, Professor V.Ya. Klimov was a student of the Air Force Academy. N. E. Zhukovsky, with lectures on the theory of aircraft engines. V. Ya. Klimov lectured a course of lectures with his main work at the Central Institute of Aviation Motors, where he headed the department of gasoline engines. Due to this circumstance, the students of the Academy had the opportunity to do practical work in the laboratories of CIAM. Since 1924, V.Ya.Klimov was the chairman of the commission for the purchase of licenses for foreign engines of the Berlin and Paris Trade Representations of the USSR. As a theoretical researcher who had extensive knowledge in the field of domestic mechanical thermal engineering laboratories, Vladimir Yakovlevich was sent to France in 1933 to purchase licenses for the construction of water-cooled engines. Vladimir Yakovlevich carefully studied all the materials related to the work of the company "Hispano-Suiza", and not only on the engines created, but also on the possible directions of development of engines of this type. Returning home, he headed the team, which based on the 12-cylinder engine "Ispano-Suiza-12" developed the design of the M-100 engine with a capacity of 750 hp Somewhat later, the same team created a family of “hundredths” engines, which for several years were the main engines of front-line aviation. The completion of work in this direction was the VK-105PF and VK-107A engines. The latter developed a power of 1500 - 1650 l. with., for the maintenance of which was supplied at a height of a two-speed drive centrifugal supercharger. By design, this engine was very perfect and was characterized by a small specific gravity. His fighting qualities were tested in the conditions of the Great Patriotic War (the engines of V.Ya. Klimov were installed on fighters of A. S. Yakovlev and on front-line bombers of V. M. Petlyakov). At the end of the war, the design bureau produced the VK-108 engine, with which it was possible to reach a speed of 745 km / h on an aircraft designed by A. S. Yakovlev. This almost completed the work on piston aircraft engines in the design office, headed by Professor V. Ya. Klimov. Shortly after the end of the war, V.Ya. Klimov and A.I. Mikoyan were seconded to an aviation exhibition in Paris with a group of our pilots flying jet planes. During acquaintance with the exhibits of the exhibition, their attention was attracted by British jet engines with centrifugal compressors, which turned out to be more sophisticated compared to what the then aviation technology had. Having received the consent of the government, A.I. Mikoyan and V.Ya. Klimov immediately after the exhibition ended, went to London, where they purchased several engines with centrifugal compressors. On the basis of these engines in the design bureau of Vladimir Yakovlevich, the RD-45 and RD-500 jet engines were built, tested and put into mass production with amazing speed. At the end of the 1940s, under the direction of V.Ya. Klimov, the first domestic air-jet engine VK-1A was created with a centrifugal compressor, which was installed on a MiG-15 jet fighter. In 1951, he created the VK-1f - one of the world's first turbojet engines with an afterburner, which was installed on MiG-17 fighters, bombers and torpedo bombers. The gas turbine engine GTD-350 was created for the Mi-2 helicopter. 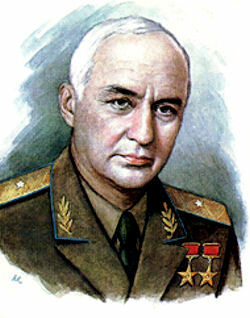 In 1953, Vladimir Yakovlevich was elected an academician of the USSR Academy of Sciences. From 1956 to 1960, he was the general designer of aircraft engines. In 1957, he was again awarded the title Hero of Socialist Labor. In parallel with the development of engines, Vladimir Yakovlevich taught at MVTU, the Air Force Engineering Academy. N.E. Zhukovsky, Moscow Aviation Institute. V.Ya.Klimov died in Moscow on September 9, 1962 and was buried at the Novodevichy cemetery. The name of the engine designer is the Scientific Production Association in Petersburg.